Camp Registration!!! Four never looked so good. After the auditorium filled with staff members, Vanessa Zielinski, the Ignite marketing exec. came on the stage. Using enthusiastic cheerleading vocals and the help of media team member Michael Martin, they pumped up the crowd with a short skit describing why camper count is important. After a drawn out drum roll, the weekly camper count flashed across the screen, and the staff burst into cheers as the number showed four people had already signed up for Ignite 2019. On February 19, camper registration for Ignineteen officially opened, reminding staff that retreat is only a short time away. While many future campers may not even have knowledge of Ignite Texas yet, staff have been praying for campers since last summer and are excited to meet them. Staff works all year to ensure camp is successful and campers leave Ignite with community and assurance that they will find a church home and ministry on campus. Throughout the year, the Lord equips our staff to lead incoming students and welcome them into the body of Christ at UT through community and support. After a lot of preparation, staff is always eager to meet the people they have been learning to care for all semester. The fact that four people have already signed up for retreat less than 24 hours since applications opened up is an incredible joy. Learning four people already know about registration and are eager to learn about Jesus and find community in Austin makes all the work worth it, even if those four were the only campers who signed up for retreat. Luke 15:7 says, “I tell you that in the same way, there will be more joy in heaven over one sinner who repents than over ninety-nine righteous persons who need no repentance.” All of the work and preparation for retreat, would be completely worth it if it meant we would see four people sprint toward God and live a life running after Christ. HE DIED FOR US!?! WHY THOUGH? It is this feeling of incomprehensible love that overflows to the love for our campers and eagerness for them to experience the same kind of love. Many of our staff have previously attended Ignite as a camper or worked at camp before and can testify how it changed their lives at college. Having a solid community of people to look to when first arriving on campus is really important. When students have people to lean on while adjusting to college life it makes students feel cared for and the first semester a lot more fun. Because of the people who intentionally poured into their hearts, many of our staff want campers to have the same experience. Having a time where we can minister to incoming students, worship, learn and experience God’s presence is an amazing opportunity. The campers who sign up for Ignite bond our staff together. We all share a love for Jesus and want to share that love with incoming students. We cannot wait to watch the camper count grow each week and see God answer prayers as the number grows. Counselor Landry Allred welcomed by staff during Reveal Tuesday night. Ignite fall leadership lined the walkway of Burdine 106 Tuesday night, jumping and cheering in excitement. With music playing in the background, co-chairs and prayer team members laughed and danced, waiting to welcome counselors into their new communities. Meanwhile, just outside the heavy, closed doors,139 counselors stood in the lobby dressed in an array of candies and holding boiled eggs, brooms and other obscure objects. Counselors form the majority of Ignite staff and hold a key role by directly serving and loving freshmen and acting as small group leaders in August. While co-chairs and prayer team spent the first semester training and building community in the fall, Ignite could not happen without counselors. After praying and preparing all fall semester, Reveal was finally here. Following a full week of interviews and prospective counselors anxiously awaiting the news, it was finally time to welcome the most important addition to the “Igniteen” staff. Senior co-chair Sydney Shin said she was “heck-a excited to have counselors.” In previous years, Shin served as a counselor in camp Taco Bell and NBA Jam. Standing in the foyer with a hard boiled egg in her hand, freshman Natalie Castiglioni described her enthusiasm about being a part of the Ignite family. At 9:30 p.m., the auditorium doors opened and the sound of fall leadership chanting “We -We love – We love our counselors” flooded the foyer as new staff came in. After a quirky game, counselors sat with their camps and answered a riddle together which scattered them throughout the building to find their core four. During this time, counselors were introduced to the theme of Ignite and the new family they will spend a lot of time with in the coming months. Near the end of the night, Dunegan formally welcomed spring leadership,speaking about why Ignite is important to him. Dunegan never attended Ignite Texas as a camper and when he entered UT, it was the first time he had been in an environment where Christianity was viewed as an inconvenience. Director of Ignite 2019, Sam Dunegan, sharing how important Ignite is to him. Dunegan said he hopes this year’s staff has an even greater experience than he had as a counselor. Christmas, New Year and NO SCHOOL. As the fall semester finished up, staff members traveled back home for the break. However, just because school was on pause doesn’t mean growing relationships were. Despite being all over the map, staff members made an effort to make intentional plans to serve the Lord, build relationships and prepare for Ignite together. Session 2 co-chair Taylor Jerding and prayer team leader Caitlin Silvus attended Passion Conference 2019 together. Passion is a 3-day Christian conference for 18-25 year olds. Each year there are speakers from all over the world to lift up the name of Jesus and encourage and teach the young adult generation. Featured speakers at Passion 2019 included Louie Giglio, pastor at Passion City Church in Atlanta, Georgia and Matt Chandler, President of the Acts29 Network. Worship leaders this year included Hillsong, Crower and Kari Jobe. This year Passion was held January 2-4. Post from Taylor’s Instagram about Passion 2019. Passion Conference was founded with the verse Isaiah 26:8 on their hearts, specifically the last phrase, “For your name and renown are the desire of our souls.” Passion Conference focuses on God’s glory and teaching that God is most glorified in us when we live lives that are fully satisfied in Him. Prayer team leader Tanya Van Zante, co-chair leader JT Dahill and media team members Illiana Parker and Caroline Betik went to Canada to volunteer with Redfrogs. During the trip, the team of volunteers were assigned to attend 17 parties and spent most of their time in clubs surrounded by party goers serving water and granola bars and fostering relationships that revealed genuine care and concern for their wellbeing. Session 2 co-chair, JT Dahill said one thing he learned from the trip was the importance of being spiritually rooted in Christ to be prepared to handle unpredictable circumstances and efficiently work and support each other in prayer at all times. Because Red Frogs come to serve, it often creates opportunity for questions, especially with a team from hundreds of miles away. All of these questions provided an excellent way to share the gospel and show them how much the team and God cares for them. Dahill said he can hone in many of the things he learned, including remaining rooted in Christ and sharing the gospel, to lead his camp in a God centered way that will help everyone become closer to Jesus and to each other. Andres Rojas came to the states when he was ten and began knowing and learning about God as he went to church growing up. In college he found the perfect opportunity to make God the center of his life by joining a local church and being a counselor in Ignite Texas. WowWowWow! December seemed to go by in a flash and so did 2018! Happy New Year!!! God did SO MUCH in 2018! Just think, we cannot even begin to list out half of the things God did for Ignite Texas last year, yet alone the entire country or world. His love and grace has no bounds and to be able to tangibly see His work in our life is a blessing. Here is just a small portion of what God DID last year in Ignite Texas. With all God did for our undeserving hearts in 2018, it is time to welcome in a new year of learning about the Lord. Let us make 2019 a year worth living. A year filled with serving and worshiping the Lord and growing and eagerness to be more like Jesus. One filled with discipleships, repentance, community, grace and all the beatitudes. Let us make 2019 a year dedicated t getting to know Him more and telling others about his unending love for us. We are so excited to continue to strive for these things in the new year with our fellow brothers and sisters in Christ and to watch God work in indescribable ways through our lives and through Ignite Texas this year. Because God blessed us with a long winter break there are only a few VERY important dates to keep in mind. Here’s whats happening in January 2019. 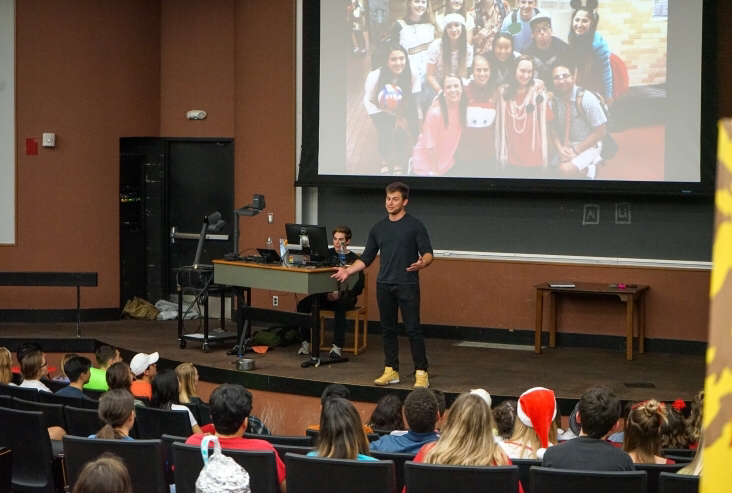 Ignite is a four-day retreat for incoming freshmen and transfer students who are looking to find Christian community at the University of Texas at Austin. HAPPY SATURDAY!! There is only ONE day left in March, so make sure to donate to our GoFundMe for Mustache March to help free the men of Ignite Texas from their crazy staches!! Welcome back from Spring Break! We hope it was a LOT better than it was for the men of Ignite Texas, as they had to bring their horrible mustaches to whatever road trip destination they went on. Prayer Team, Jared Villarreal just asks “please help our MOG”. Keep sharing your staches and donate to our GoFundMe to stop this March (mustache) MADNESS. Big news. RETREAT REGISTRATION IS NOW OPEN! Yes yes yes, we are so excited to welcome #ut23 to #ignineteen! Check out the link in our bio to sign up for the best start to your time on the 40 Acres! • • • Hey Ignite staff, leave a welcome message below for all our future #campers!!! Support us as you shop! Visit smile.amazon.com with your same Amazon login, and Amazon donates 0.5% of your purchase to a charity of your choice (aka Ignite Texas).